Many homeowners are stopping for a moment to consider what is truly important in their lives. For most, the answer is friends and family. Some people are leaving their larger homes for a more minimalistic downsized lifestyle that allows them to do more of what they want. Some of the new homes popping up all over the country have floorplans that center around what many are calling “open concept kitchens” using granite countertops. These homes have clean lines and a back to basics approach that makes granite countertops that epicenter of family activity. Although this new trend is kitchens is one of the most functional, they are still stunning. Sprawling granite countertop islands have farmhouse sinks and beautiful pendant lighting making it an inviting space for friends and family. Open concept kitchens with granite countertops maximize the appearance of space. In the past, the kitchen was separate from the dining room and family room, but this design trend opens everything up for an all in one. This promotes quality family time around the granite countertop. While someone is preparing tonight’s dinner, kids can work on homework, and friends can enjoy conversation and a glass of wine. This seamless flow helps busy families multitask all in the same space. There are two key elements to an open concept kitchen – no walls and large islands and sprawling granite countertops. 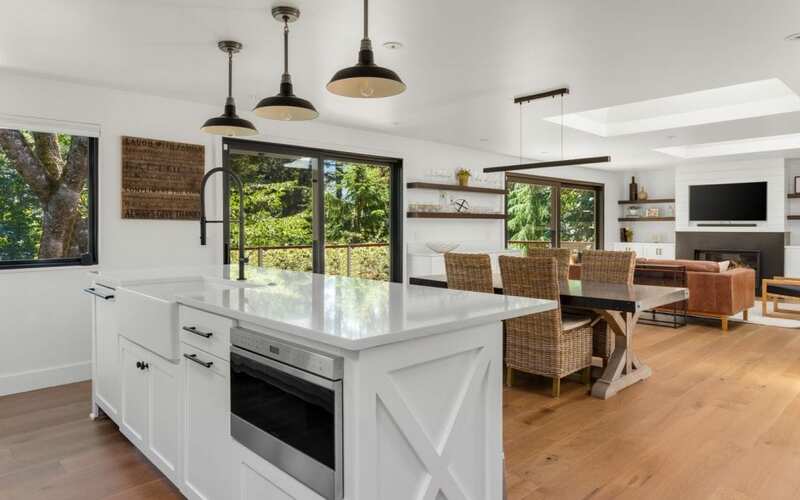 Where Did The Idea of Open Concept Kitchens Originate? Homes in the 1900’s were designed to accommodate different rooms that were very separated. The kitchens were built for cooking and not entertaining. During this time the number of rooms in a home was a status symbol unlike today when open kitchens and granite countertops get the attention. Granite countertops come in a variety of patterns and colors making it an effective way to make your kitchen unique. Open concept kitchens with granite countertops create an easy flow for traffic in/out and all around the kitchen. Open concept kitchens with granite countertops foster social interaction and family involvement. Open concept kitchens with granite countertops are adding value to homes because of their popularity. If you live in an older home and would like an open concept kitchen with granite countertops have a contractor come and see what walls you can knock down to create the look. How will you incorporate the living areas that surround your open concept kitchen with granite countertops? This means making sure that design themes are consistent and complementary with each other. Consider using the granite countertop selection as the focal point for color schemes. Are you ok with open shelving and kitchen items being exposed? When it comes to an open kitchen concept with granite countertops, walls are the first thing to go and this results in no space for cabinetry. This means getting creative with storage and using the granite countertop to display small appliances like blenders, coffee makers, and food processors. Open concept kitchens with granite countertops eliminate butler pantries and formal dining rooms. So, if you like hosting dinner parties this might be a consideration you will want to think about. Now that you know a little bit about open concept kitchens with granite countertops you may be able to decide if they are right for you. Either way granite countertops are a great addition to any kitchen despite the floor plan. If you are thinking about incorporating granite countertops in your open concept kitchen, get in touch with us! We have a wide variety of stones on hand at all times, and we proudly offer wholesale pricing to the public!